Fix the Debt is listed as a project of the Committee for a Responsible Federal Budget on the CRFB website, itself a project of the New America Foundation (NAF), which is also funded by the Peter G. Peterson Foundation. With regard to Fix the Debt and its many partner organizations, the National Journal observed, "Singlehandedly, Peterson has created a loose network of deficit hawk organizations that seem independent but that all spout the Peterson-sanctioned message of a 'grand bargain.'" This echo chamber has an impact on the debate in Washington, D.C. Peterson "has empowered those working on the issue because he has funded them," Michael Ettlinger, vice president for economic policy at the Center for American Progress (CAP), told the National Journal. "That has an effect because those voices get amplified, and it affects the atmospherics." 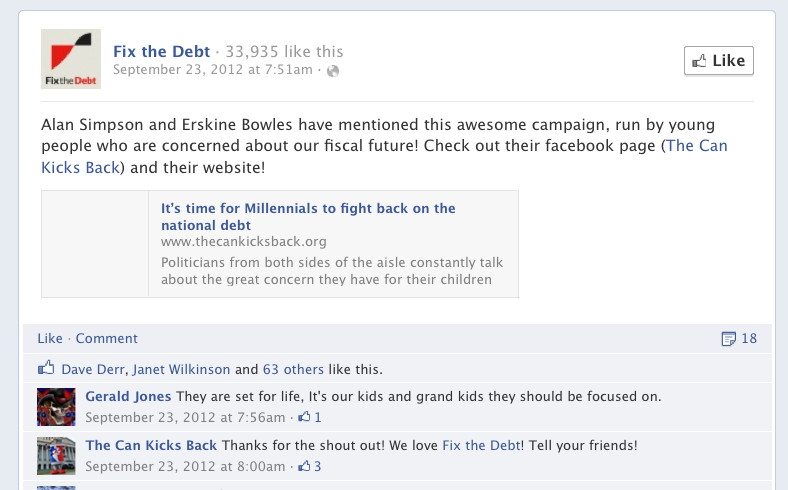 Fix the Debt is listed as a "project of" the Committee for a Responsible Federal Budget (CRFB) on the organization's website as of February 2013. CRFB is itself a project of the New America Foundation (NAF). The Peter G. Peterson Foundation gave NAF $2,050,000 from 2009 to 2011. CRFB used to be an independent organization, but became associated with NAF in 2003. NAF, a not-for-profit 501(c)(3), reported $16.8 million in revenue on its last publicly available federal tax filing in 2010. It is not certain how or if it will disclose the $60 million being raised for Fix the Debt. In October of 2012, three months after its launch, Fix the Debt newly incorporated as a 501(c)(3) in Delaware. NAF is also funded by many of the top Fortune 500 companies that would benefit from the tax breaks being pushed by Fix the Debt. For instance, Microsoft's Bill Gates gave more than $1 million to NAF in 2011 through his foundation, as did Google executive chairman Eric Schmidt, who now chairs NAF's board. According to a 2012 report from the Institute for Policy Studies (IPS), Microsoft would be one of the big winners if the United States switched to a territorial tax system of the type advocated by Fix the Debt, shaving some $19 billion off the taxes it pays to fund the United States government. Many NAF donors are also on Fix the Debt's CEO Council, including: Aetna, BlackRock, Google, Humana, UnitedHealth Group, United Parcel Service, Wal-Mart, and Merck. NAF board member Steve Rattner is on the steering committee of Fix the Debt, as are CRFB board members Erskine Bowles, lobbyists Vic Fazio and Jim Nussle, and Alan Simpson. Since 1981, CRFB has kept up a steady drum beat of seminars, reports, "blue ribbon" commissions, and the like, all focusing on the nation's debt crisis and the need to reform "entitlements" such as Social Security and Medicare, which are better described as earned benefit programs that American workers pay into with each paycheck. Pete Peterson, Erskine Bowles, Alan Cranston, and Alice Rivlin all serve on its large board. In the 1990s, CRFB formed a "Cost Containment Coalition" that objected to the Clinton Health Care reform proposals and any new taxes to pay for health care for Americans. CRFB's opposition was portrayed as a tough, principled stand, but years later, documents were revealed that showed that the Tobacco Institute, a now defunct industry lobbying group, funded the coalition while Philip Morris funded CRFB President Carol Cox Wait. Internal Philip Morris memos found in the Tobacco Library describe how the firm worked with CRFB to set up the coalition to help the company achieve its "overriding objective" of avoiding tobacco excise taxes as part of any health care reform package, even though tobacco-related illness contribute to the national cost of health care. The Concord Coalition received $6,036,060 (including $1,500,000 in matching funds) from the Peterson Foundation from 2009 to 2012. The Concord Coalition, which was founded in 1992, lists Peter Peterson as its co-founder. It specializes in taking the fiscal austerity message outside the beltway with costly tours and town hall meetings. On January 28, 2013, the Concord Coalition announced that it is partnering with Fix the Debt on a series of public forums. According to the Concord Coalition's website, "This joint project will focus its efforts on ten programs in six states: Colorado, New Hampshire, Iowa, Wisconsin, Florida and Tennessee." All of the states the programs are featured in, with the exception of Tennessee, were swing states in the 2012 presidential election. This tracks with what Fortune characterized as the "next stage" for Fix the Debt and its partner organizations: "Up to this point, Fix the Debt's ad campaigns have been largely Washington-focused, combined with a heavy dose of CEO-lobbying. The next phase, Romano says, is national outreach. The campaign increasingly resembles a presidential race, with grassroots-style organizing and offices in places like New Hampshire, Ohio, Florida and Michigan." The first Concord Coalition forum on January 29, 2013 featured Timothy Pagliara, founder of Enact the Plan, a group created explicitly to promote support for the Simpson-Bowles Plan. 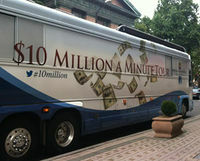 Similarly in 2010, the organization engaged in a "Fiscal Solutions Tour," which was launched on September 28, 2010 prior to the conclusion of the Simpson-Bowles Commission. Had the commission succeeded in advancing a bill to Congress, the tour could have been the deficit scolds' main vehicle for rallying grassroots support to a Simpson-Bowles austerity bill. Economist James K. Galbraith called the tour "the latest Peter G. Peterson Foundation effort to rouse the public against deficits and the national debt -- and in particular (though they manage to avoid saying so) to win support for measures that would impose drastic cuts on Social Security and Medicare." The tour was conducted with support from the Peter G. Peterson Foundation and included the following primary speakers: Robert Brixby of the Concord Coalition, Douglas Holtz-Eakin of the CRFB, William Novelli (the Republican former CEO of the AARP), Isabel Sawhill of the Brookings Institute, and former Peterson Foundation Director and founder of the Comeback America Initiative David M. Walker. The tour visited Iowa three times, as well as California, Pennsylvania, New Hampshire, Texas and Georgia. The Comeback America Initiative received $3,100,000 from the Peter G. Peterson Foundation from 2011 to 2012. The Committee for Economic Development (CED) has received $1,853,616 from the Peter G. Peterson Foundation since 2009. In the lead up to the 2012 elections, the CED hosted four forums as a part of its Fiscal Health Initiative, the specific project the Peter G. Peterson Foundation funded through its 2012 grant. These forums implored legislators to enact fiscal austerity measures, including cuts to Medicare and Medicaid. The so-called "premium support" model of Medicare "reform" advocated by CED, involving vouchers for private insurance plans, would "end Medicare as we know it," according to economist Dean Baker: "Under the Republican plan there is absolutely no guarantee that beneficiaries would be able to purchase plans that cover the services that IPAB [Independent Payment Advisory Board] might exclude from Medicare coverage. . . . Furthermore, the Congressional Budget Office (CBO), based on extensive experience with private sector insurers who already operate in the Medicare system through Medicare Advantage, projects that private insurers will hugely increase the cost of getting Medicare-equivalent policies. This is both due to the fact that private insurers have much higher administrative expenses than the public Medicare system and also that they are less effective in containing costs." The Can Kicks Back is not listed on the Peter G. Peterson Foundation website as a current project, but it appears to be a project of the Peterson-funded Fix the Debt campaign. The group has been treated uncritically by the press, as puff pieces in the LA Times and the Washington Post show. 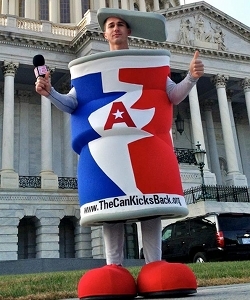 These pieces fail to reveal the group's funders, although the Fix the Debt logo now appears on most Can Kicks Back films. ↑ 3.0 3.1 3.2 3.3 Peter G. Peterson Foundation, New America Foundation/Committee for a Responsible Federal Budget, organizational website, accessed January 2013. ↑ 4.0 4.1 Peter G. Peterson Foundation, Comeback America Initiative, organizational website, accessed January 2013. ↑ 5.0 5.1 5.2 Peter G. Peterson Foundation, Committee for Economic Development, organizational website, accessed January 2013. ↑ 6.0 6.1 Peter G. Peterson Foundation, Concord Coalition Corporation, organizational website, accessed January 2013. ↑ New America Foundation, 2010 Form 990, organizational IRS tax filing, October 26, 2011. ↑ Delaware Department of State Division of Corporations, Fix the Debt Coalition Delaware Incorporation Record, state governmental website, incorporated October 9, 2012, accessed January 2013. ↑ 10.0 10.1 New America Foundation, Our Funding, organizational website, accessed January 2013. ↑ Sarah Anderson and Scott Klinger, Institute for Policy Studies, The CEO Campaign to 'Fix' the Debt: A Trojan Horse for Massive Corporate Tax Breaks, organizational report, November 13, 2012, p. 3. ↑ 14.0 14.1 Philip Morris Corporate Affairs, Corporate Cost Review, corporate affairs summary, July 20, 1993, p. 5. ↑ 29.0 29.1 Richard Eskow, Six Degrees of Social Security: The President, the Senator and the Billionaire, Huffington Post, September 7, 2012. ↑ Committee for Economic Development, Issues: Federal Budget: Events, organizational website, accessed January 21, 2013. ↑ Joseph Minarik, Committee for Economic Development, What is the "Medicare Guarantee"?, Back in the Black, organizational publication, June 25, 2012. ↑ Dean Baker, Medicare Costs Too Much and They Better Not Cut It, Huffington Post, March 19, 2012. ↑ 38.0 38.1 Suzy Khimm, Meet the millennial deficit hawks, Washington Post, November 12, 2012. ↑ Jeremy Duda, Just got a bag of empty soda cans from Fix The Debt delivered to me at work to urge feds to "stop kicking the can down the road." Cute., tweet, Twitter.com, January 15, 2013. ↑ Jim Puzzanghera, Group mobilizes young people to push for fiscal-cliff solution, LA Times, November 12, 2012.